At home I have put many beans through the grinder, into the stovetop and drunk usually as a long black with flat milk (I am drinking one as I write this). I have had several bean favourites but these were blown away when I tried the Italia blend from Tony Gibbs recently. Although his tiny café on the Terrace has been operating since 2001 it has been unnoticed up until now. Maybe this is because the sign overhead remains blank and the café doesn't even have a name. The lack of a sign was no hindrance to the flow of people coming in and out of the cafe while I was photographing, most of them exchanging greetings with Gibbs while he roasted beans. The beans are roasted in a fully restored Aug Olsen originating in Denmark. 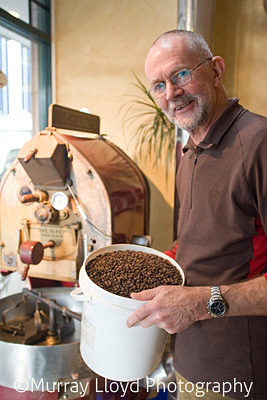 Gibbs has been roasting beans since 1987 when he was trained by George Kepper, an Australian based Russian who consulted several of the big roast companies in Sydney from time to time to correct blends and adjust roasts that were not quite right. The Italia blend was perfected by Gibbs on visits to Kepper in Sydney and has not been altered since 1987. Of the beans Gibbs purchases for his café he rates the Columbian Medellin Supremo as the best (and the most expensive), supplied by John Burton, New Zealand’s primary importer of beans for smaller roasters. Gibbs’s blends, aside from the Italia include TG Pearl, Indian Mysore (named after the Southern Indian province where it comes from) and Brazilian which is made especially for the drinkers at Taste Café in Kelburn, one of two cafes Gibbs supplies (the other is Salvation in Newtown). Located in Wellington’s corporate heartland (the PM drops in for coffee and the Treasury is right opposite) it is great to see someone putting taste firmly on the bottom line.